Wizards return to Baltimore for 40th anniversary of move to DC, Melo back home. 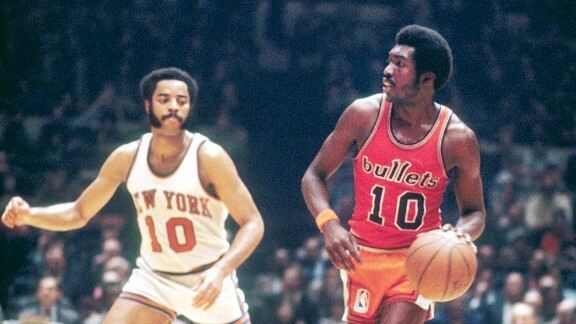 To mark the 40th anniversary of the franchise’s move from Baltimore, where it spent 10 seasons, the Wizards are returning for an exhibition game against the New York Knicks on Thursday at Baltimore Arena. The matchup is significant for many reasons, given the bitter rivalry the Bullets once shared with the Knicks and the current presence of Baltimore native Carmelo Anthony, the New York forward who has yet to play an NBA game in his home town. Not much of an NBA fan, but this article was a pretty good read. Melo returning back to one of his home cities(moved to Bmore from NYC when he was 8), the Wizards honoring the Baltimore Bullets. All good stuff, but the real reason I read this was because Earl Monroe was the head liner. After his reference in He Got Game (http://www.youtube.com/watch?v=vdzfTA0jUUk), how could you not become a fan. Earl “Jesus” Monroe averaged 42 points per game for the Bullets. Absolute animal. Grew up playing street ball in Philly to toughen him up. One of the best to play the PG spot. According to Wikipedia “His high school teammates at John Bartram High School called him “Thomas Edison” because of the many moves he invented.” Now thats a nickname. I love having premium television, based on the fact that Point Break, He Got Game, Road House and A Knights Tale are frequently on. He Got Game, other than Ray Allen’s acting, is phenomenal. Love how it’s shot, love the music, love the acting. Just a classic “Spike Lee Joint”. So many memorable scenes, the college visit, the meeting with the agent, the drive with Sweetness, Denzel knocking that dude out, but the one on one scene at the end is one for the ages. (http://www.youtube.com/watch?v=xdI6vTEGeDA). I bet you Ray Allen actually took these 2 hoes down off set, possibly on set. This entry was tagged Baltimore, Baltimore Bullets, Carmelo Anthony, Denzel Washington, Earl Monroe, He Got Game, Jesus Shuttlesworth, New York Knicks, Ray Allen, Spike Lee, Washington Wizards, Wizards Nick, Wizards return to Baltimore. Bookmark the permalink. ← Top baby names of 2013. Good Lord.